Machines fail for a reason. They’re not supposed to wear out. Humans are at the root of the vast majority of these failures. It’s also humans that can intervene and restore plants to healthy and sustained operation. This is not an imaginary concept but rather a living reality in a growing number of companies today. Machine failure can deliver an important lesson on future prevention and remediation. Fortunately, there have been countless investigations into failure causes across wide-ranging machine types and applications. This learning has enabled organizations to greatly enhance reliability but only when machine and programmatic modifications were applied. Lubrication and reliability training programs are designed to teach this collective knowledge about failure prevention. Still, knowing is not the same thing as doing. Lubrication-enabled reliability (LER) relates to all activities that improve reliability through tactical changes in the use and application of lubricants. LER offers specific benefits and opportunities that don’t exist with alternative reliability strategies. 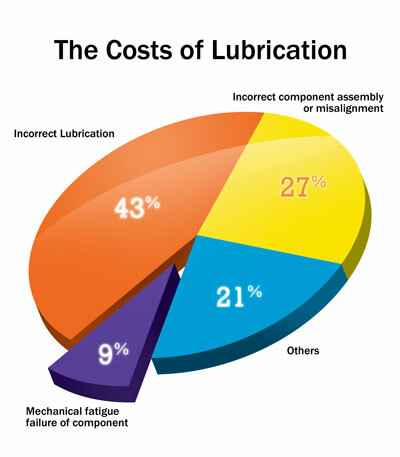 Yet, most companies seem to be in denial when it comes to lubrication. They see themselves as being lubrication responsible – a misguided belief that they are already doing an adequate job with lubrication. It’s like healthy living through a proper diet. It’s not a matter of just eating but rather the discipline of eating the right foods every single day. The same applies to lubrication. It’s not about blindly going through the same old tasks of lubricating your machines. This will not enhance reliability. Instead, LER is about reinventing how lubrication is done. This fact is learned from hundreds of published case studies on lubrication. It’s very much like an untapped vein of gold that lies just below the surface. It’s near at hand but difficult to see. Fundamentally, LER has to be a business decision. Managers face wide-ranging opportunities when it comes to change and investment. Sound business judgment needs to be applied in deciding what to change next. Conversely, the cost of repairing or replacing a failed machine (plus the associated lost production) is not a business decision that is carefully weighed against all options. It is outside of the control and judgment of management. The decision is driven entirely by the machine and its failure. The wisest thing managers can do at that point is to invest in a skillfully performed root cause analysis (RCA) followed by the prescribed changes needed to prevent reoccurrence. The investment must have the potential to yield deep, rich benefits that outstrip the potential cost and risk. It can’t be simply a mild chipping away at maintenance costs but rather a bona-fide homerun opportunity. The magnitude of the opportunity is influenced by the current state of reliability (or unreliability). For instance, a company’s approach may be just to continue reactive maintenance using the 4-R treatment – rapid component replacement, repair, removal or rebuild. In such cases, the opportunity is rich; the worse things are, the better the opportunity for change. LER doesn’t respond to failure but aspires to address the root cause. What is in constant contact with the machine that over time influences the rate of wear and corrosion? It is the lubricant. What, if changed, is best able to slow down that rate of wear and corrosion? Again, it’s the lubricant. While there are other influencing factors, lubrication is the greatest common denominator. As a case in point, see Figure 1. 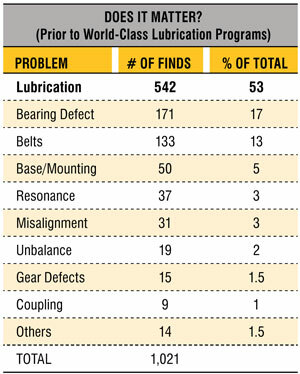 Fifty-three percent of all problems reported by this unnamed company were lubrication related. In addition, those that were not lubrication related (e.g., bearing defects, gear defects, unbalance, misalignment, etc.) would have been revealed by simply analyzing the lubricant (wear debris analysis). Figure 2 is a plant-wide tabulation of the causes of mechanical failure reported by another company. The incorrect choice and usage of lubricants totaled 43 percent. The Pareto Principle teaches us that the greatest yield from programmatic changes occurs when we focus on the 20 percent of the causes (critical few) that are responsible for 80 percent of the occurrences of failure. Unarguably, there is much that’s outside the realm of control for most reliability and maintenance teams. For instance, we can’t inherently know which bearings and gearboxes have design and manufacturing defects. However, we can control the quality of the job we do in mounting, fitting and installing machines/components. From that point forward, it’s about wellness management – careful and continuous nurturing of machine health. Fortunately, lubrication-enabled reliability is not high science. Any maintenance organization can accomplish it with proper training, planning and deployment. Much of it is behavior based and just good old common sense. It’s about making modifications of people, machines, procedures, lubricants and metrics. People Preparedness. People are trained to modern lubrication skill standards and have certified competencies. Machine Preparedness. Machines have the necessary design and accouterments for quality inspection, lubrication, contamination control, oil sampling, etc. Precision Lubricants. Lubricants are correctly selected across key physical, chemical and performance properties, including base oil, viscosity, additives, film strength, oxidation stability, etc. Precision Lubrication. Lubrication procedures, frequencies, amounts, locations, etc., are precisely designed to achieve the reliability objectives. Oil Analysis. This includes optimal selection of the oil analysis lab, test slate, sampling frequency, alarm limits, troubleshooting rationale, etc. These ORS attributes are simple, fundamental changes that are within a plant’s ability to modify and manage. They are definable, measurable, verifiable and controllable. Stop fixing the machine and start fixing what causes the failure. This is proactive maintenance. Of course, it is hard to invest in something that is not yet broken. People are quick to respond to crisis but procrastinate to make changes when plants seem to be running reliably. Lifestyle changes sometimes require the jolt presented by a good health scare. Crisis puts focus on reliability. Change by aspiration alone is far rarer. To de-risk implementation, you need leaders to champion the effort, good communication to stakeholders, adequate financial investment, and lots of monitoring and measurement (during and after deployment). Good implementation of LER follows along the lines of good project management. Be methodic and consistent. Rome was not built in a day. If you choose to take the do-it-yourself route, then start by getting the knowledge and help you need. You won’t find world-class lubrication in your machine’s service manual. Sometimes you need an intervention. You can wait for a crisis to get things started, or you can start today. After all, you can’t harvest the benefits of LER until sustained implementation is in place. Opportunity knocks today. Open the door. Nippon Steel, which is a past recipient of the Total Productive Maintenance Excellence Award, was the focus of a widely published case study on the benefits gained from lubrication excellence. The company implemented lubrication changes toward achieving the ORS and realized amazing benefits over a period of years in just one area of its plant. Bearing failures dropped from nearly 400 per month to just 12.